A Medium New Mexico Red Chile powder. Great Flavor, Medium Heat. 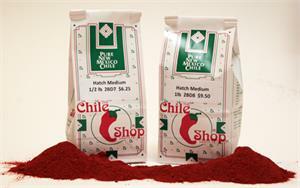 We moved from Santa Fe over a decade ago, so we order hatch chile from the Chile Shop regularly. It's a problem if we run out. Highly recommend for fantastic chile sauce. For us, there's no substitute. i've made red sauces with a number of different powders from the chile shop. The hatch medium for me is precisely right: spicy but not over-spicy and a really rich flavor. i add a tbsp of good quality paprika, some browned garlic, and a little more cumin (roasted) and oregano than the package calls for. SERIOUSLY good, even by santa fe standards, which are seriously high. Got the half pound bag and went through in about 4 batches of enchilada sauce. The receipe on the back of the bag is terrific. 10X better than any store bought sauce in a can. Moving up to the one pound bag today. BTW, you've got a nice, simple, easy to use web store.